Mock Trial is a national competition held each year in which students argue a fictitious court case against teams from other schools. Students from Cal Poly’s four Mock Trial teams travel up and down the state during fall and winter quarter, sacrificing weekdays and weekends for competition and the goal of advancing to nationals. 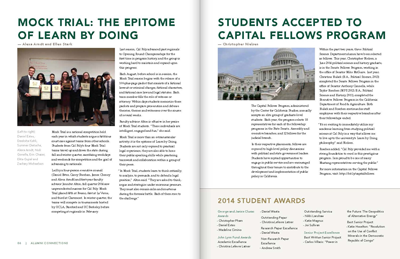 Led by a four-person executive council (Daniel Estes, Casey Sheehan, James Cheney and Alexa Arndt) and first-year faculty advisor Jennifer Alton, fall quarter 2014 saw unprecedented success for Cal Poly. Mock Trial placed fifth at Fresno, first at La Verne, and third at Claremont. In winter quarter, the teams will compete in tournaments hosted by UCLA, Stanford and UC Berkeley, before competing at regionals in February. Last season, Cal Poly advanced past regionals to Opening Round Championships for the first time in program history, and the group is working hard to maintain and expand upon this progress. Each August, before school is in session, the Mock Trial season begins with the release of a 100-plus-page packet that consists of a fictional lawsuit or criminal charges, fictional characters, and fictional case law and legal statutes. Each team member fills the role of witness or attorney. Within days students memorize these packets and prepare prosecution and defense theories, themes and witnesses over the course of several weeks. Faculty advisor Alton is effusive in her praise of Mock Trial students. “These individuals are intelligent, engaged and fun,” she said. Mock Trial is more than an extracurricular activity; it is the epitome of Learn by Doing. Students are not only exposed to practical legal experience, they are also able to hone their public speaking skills while practicing teamwork and collaboration within a group of their peers. Download a pdf of this article or a pdf of the full newsletter.